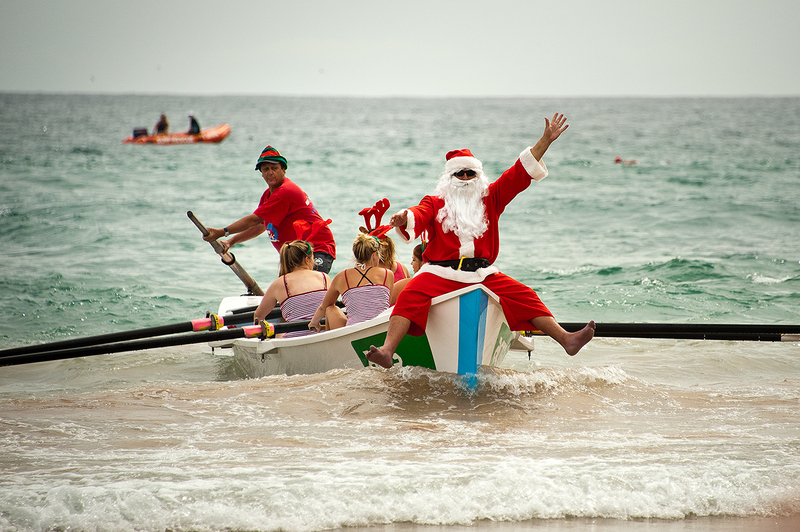 I had recovered from my experience at Bronte and so I looked on the calendar on oceanswims for the next event. There was a race at Bilgola on the weekend after Bronte, but I decided against swimming that event after looking at the forecast. The following weekend had an event at Manly, a place I was familiar with due to my occasional swim with the Bold and Beautiful group. There were two races on the day: the one km and the two km. The location has the advantage of being protected from easterly and southerly swells. My wife and I caught the ferry to Manly which is a very pleasant way to commute to the swim. It saved the hassles of driving and finding a park in Manly, and it is always beautiful on the harbour on a summer morning. The one km course was similar to the Coles Classic from Shelley Beach to Manly beach, with the advantage of a vastly reduced field. This course is also very protected and goes across the aquatic reserve at Cabbage Tree Bay. There is always plenty of marine life to observe when swimming. There were several members of the squad doing the swim, though not as many as for the eastern suburbs events. We wandered over to the start line at Shelley Beach and waited for the start. 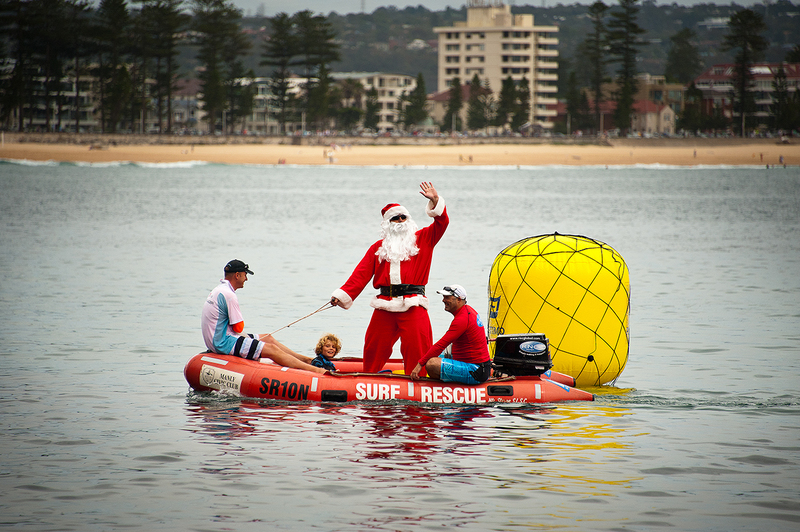 The starters were very relaxed, which may have had something to do with the presence of Santa Claus with the water safety crew. Once again I had entered two races, but this time I wanted to swim a fast time for the one km event. As my wave entered the water I took my usual place on the edge and headed towards the first buoy near Fairy Bower. This time the water was smooth and flat with only a gentle zephyr disturbing the water. This suited me just fine and I powered through the water. There was only a small shore break as I entered the wave zone after rounding the point. I caught a small wave and stood up and ran fast (well fior me anyway), and crossed the finish line. My time of just over fifteen minutes was a very good time for one km, and I was placed in the top one hundred. A very pleasing result. The only problem was that I may have swum a bit too hard and now I had to do the two km race. I was keen to beat Michael again, but he was canny and only entered the longer race. This race started at North Styne and then out to sea for several hundred metres before turning right to cross the reef into Shelley Beach. It then followed the one km course to finish at Manly Beach. Once again Michael and I were in different waves and my wave entered first. By the time we started the sea breeze had just started up so the water was not as smooth as it had been for the earlier swim. Luckily there was only a small break to get through and I had managed to locate a small rip to help me get out. The swim was enjoyable, especially crossing the reef near Shelley Beach. It is always fun swimming in places that are different in controlled conditions. I had planned to swim fairly steadily until I got to Shelley beach to save energy for the second half of the race. This time I followed the plan, and when we turned just off Shelley Beach I increased my speed for the final push home. After all I wanted to try to beat Michael. The rest of the swim was uneventful. I crossed the line in a little over thirty-eight minutes to finish around half way in the field of just under 400 hundred. Unfortunately for me Michael beat me by a minute. Clearly his decision to miss the one km race worked for him. It is great to swim at these swims on the northern beaches as the competitors are usually more relaxed than the normal eastern suburbs crowd.